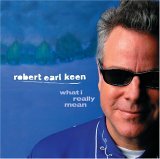 On his previous studio recording Farm Fresh Onions, Robert Earl Keen attempted to capture the rough and rowdy edginess of his concerts. The outing proved not only to be a hit-and-miss affair, but also to signal the possibility that perhaps he had lost his way. Indeed, the sturdy, cinematic lyricism that typically has marked his finest efforts was missing almost entirely from the collection, and the subsequent issuance of Live from Austin, TX, which featured his full-length performance on Austin City Limits, offered an acknowledgment that maybe he had failed entirely in his mission. In recording his 12th album What I Really Mean, the Texas-born songwriter once again turned to his stellar touring band for support, but the end result is vastly different. On a crunchy cover of Jimmy Driftwood’s Long Chain, for example, Keen relays the energy of his stage persona better than anything on either of his preceding pair of projects, while the jazz-tinged title track puts forth a wistful examination of the impact that his chosen profession has had upon his marriage. Elsewhere, he delves into the suicidal strains of The Dark Side of the World with all the boozy swagger of the Rolling Stones; paints a surreal, honky-tonk-colored depiction of Hank Williams on the aptly titled The Great Hank; and laces the allegorical, country-rock narrative Mr. Wolf and Mamabear with a worldly rhythmic groove. That Keen was able to bounce back so readily from what undeniably was the low point of his career in order to craft the superlative reflections of What I Really Mean is a true testament to his highly underrated skill at crafting country music concoctions that draw as much from the genre’s classic lineage as they do from its modern-day, alternative disposition.